Jon refuels with diesel, at sea! Yesterday was a delightful day but in a rather diesel intensive way. The seas were calm, the sky was bright, the clouds were fluffy, but there was no wind. 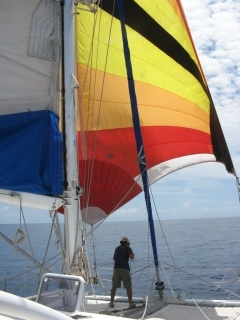 We always have the mainsail up to catch what wind we can, but the light breezes actually came from all over, so the main did little except to steady Ocelot in the light swells. 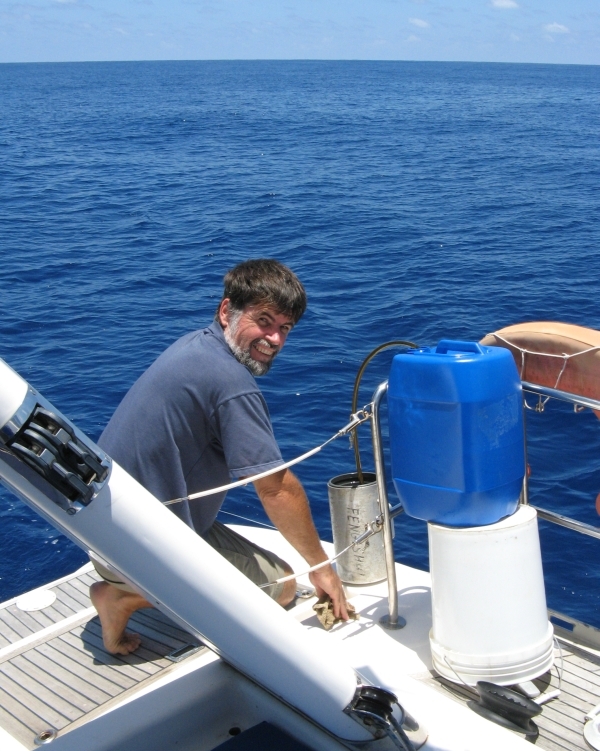 About noon we swapped over to the starboard engine and Jon refilled the port tank from jugs we bought and filled in the Seychelles. These long motors, longer than any we've had before, give us a chance to more accurately determine Ocelot's fuel consumption. Although the engines behave slightly differently, they're both Yanmar 4JH2CE 48 hp diesels. We found that running our port engine at 2000 rpm consumes 2.76 liters/hour, to push us through the water at 4.8 knots, giving us 1.76 miles/liter. Or, if you like the way the railways figure these things, 25.4 ton‑miles/liter. But that's running a less efficient 2 bladed folding prop, after the whale bent the 3 bladed prop that was on the port side. The starboard engine, with its 3 bladed prop, only burns 2.1 liters/hour at 1900 rpm to make 4.3 knots, giving us 2.06 miles/liter (or 31 ton‑miles/liter). So we use the starboard engine most of the time. Shortly after noon we saw a disturbance in the water ahead of us. 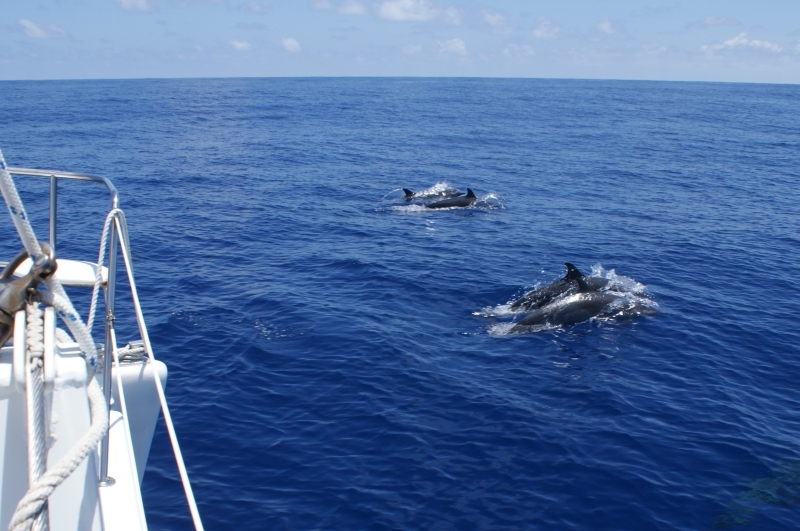 Binoculars revealed that it was a HUGE pod of dolphin, headed our way! 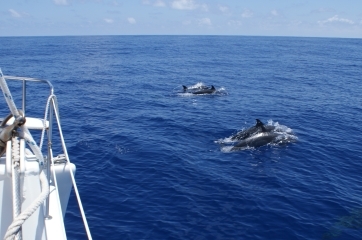 Soon we were surrounded by well over a hundred Pan-Tropical dolphins, playing in our bows, surfacing to breath together in waves of up to 10 at a time, and even leaping out of the water to spin around and splash back in again! We watched them from our bows for ages, swimming in the crystal clear, deep blue ocean. The calm conditions made for a very flat day, so Sue had fun in the galley. Breakfast started off with her light and fluffy crepes stuffed with bananas fried in brown sugar and topped with whipped cream, served with chilled fruit juice as we watched the sun rise. Lunch was one of her wonderful chefs salads - lettuce, cucumber, and tomato with chopped ham, grated parmesan and her tangy homemade honey-mustard dressing. 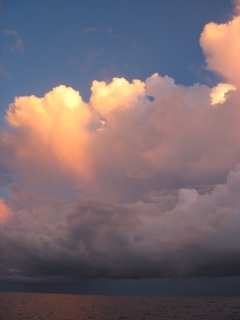 Dinner was a pork stir-fry with the sun setting behind us and lighting up the clouds in front of us with warm pastels. After supper Jon realized that we still had the fishing lines out. Since we don't fish at night (too difficult to deal with a fish then) he was pulling them in when he felt a strike! Sue was busy trying to photograph the sunset but she pulled the cushions out of the way and then photographed Jon bringing a small tuna over the side. No doubt tuna will feature at meal time today. As I write this (9am) we're at 1°37'S 63°12'E, or 482 nm from the Seychelles with 600 nm to go to Gan. We motored all night but this morning there's a slight breeze(!) so we've turned off the engine and we're ghosting along at 2‑3 knots. Hope it lasts! Sue here. Finally coherent after 4 hours of sleep. The last few nights at sea have been beautiful -- the sort of nights I recall from our Atlantic crossing in 1980 and again in the eastern Pacific in 2003. The sea a black disk of shimmering silk, undulating softly beneath us. Overhead the sky a paler grey pin-pricked with stars. The air a moist caress on bare skin. After so many violently rough and noisy, spray-filled passages in the Mozambique Channel and the southern Indian Ocean, the last few days have been a blessing. As of 10 pm last night we were more than half way to Gan! Wonders never cease! It is sometimes hard to believe that we are making progress towards anywhere. There are no landmarks, no street signs, no cross-roads. Only colorful marks on the electronic chart that show a little stylized boat moving between dots on the ocean. Actually there ARE cross-roads - we've been passed by 3 ships: 2 tankers and a cargo vessel headed for, we assume, India. Yesterday a fully laden 600 foot (200 m) tanker steamed behind us heading for the Arabian Sea. Are they taking coals to Newcastle? The pirate activity in this area has resulted in a less-friendly community of sailors. Normally we would be having little radio chats with these ships, finding out where they are headed, where they've come from, if they can see us on radar, answering question about our boat and family. But now we communicate only if needed, to be sure we do not collide. No friendly chit-chat. No giving away positions at sea. Speaking of which, at 9am Seychelles time we're at 1°20'S 65°12'E. Deeply and truly in the Tropics - temperatures yesterday hit 92°F (33°C). We have 480 more miles to Gan. I look forward to a dip in the (relatively) cool ocean once we arrive. The sea of silk has turned to a sea of pilled fleece with 10 knots of wind. No complaints. The deep throb of the engine is stilled at last (after 24 hours!) and we are under sail again.